Cloud computing is more of a business model than something technical. Cloud application providers build applications and run it themselves. The customer logs in and uses the application and the provider charges them per transaction. These providers are said to be “on the cloud”. Google docs is an application on the cloud. The Google Doc application runs on Google servers and is made available to users at realtime. Some clients prefer this model because they don’t have to bother with the set up and maintenance of the installations. For example a company may build an online CRM application or a Health Care application, and clients may subscribe to it and pay for the use. The servers running cloud applications may need to service huge loads depending on the demand. Security violation is always a concern, for instance, for health care clients and banking clients, because the client’s private data runs on these remote servers, but if the cloud vendor provides sufficient data/processes etc, then customers are all right with it. For instance the cloud vendor may have to adhere to the client’s audit requirements about network security, processes, etc. I am using JBoss Developer Studio 4.1.0 GA. I add JBoss AS server runtime to the classpath. This gives me the advantage of not explicitly including hibernate/ jpa jars on my classpath. Jboss AS server has inherent support for JPA through an underlying hibernate layer. The only additional jars that I add to the project are from the spring 3.1.1 RELEASE. This is also necessary because I use some features that are supported by the 3.1.1 version – namely the doing away of a separate persistence.xml. 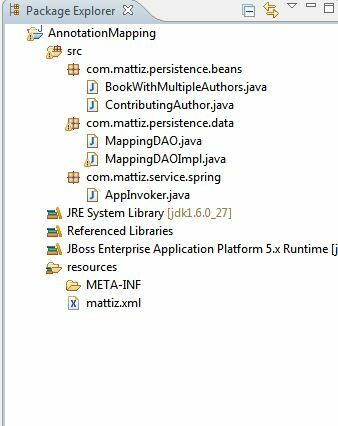 I do not use the jboss server instance to run the application though, since like the last example this one too, is a standalone Java project, to keep things simple. This example uses JPA and the source code has no hibernate references except for the database configuration file. This gives the advantage of DAO layer portability with which you could port the app over to TopLink, EJB3 or Ibatis which like Hiberenate also implement JPA, without any source code changes. – to make it JPA enabled. Note: I had to add the spring configuration file – mattiz.xml in the reources folder to the classpath so that the spring jars could locate it. String jpaql = "select e from BookWithMultipleAuthors e "